Fabulous, fresh & inviting! New gray paint * New carpet, & new white baseboards throughout * New architectural roof * New siding * New gutters! 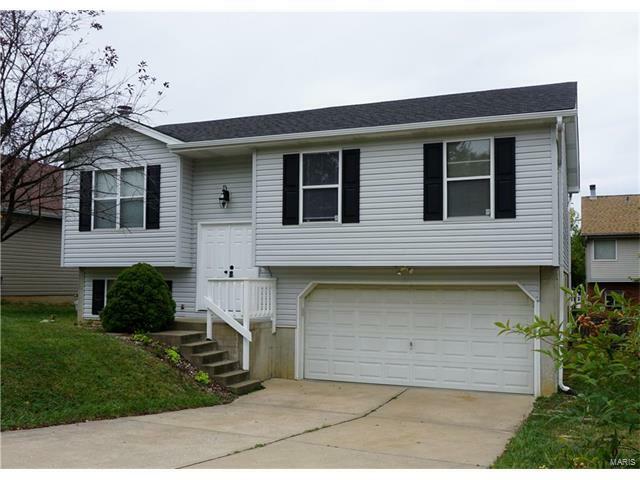 Open floor plan home with 3 bedrooms + 2 updated full baths on main level. Vaulted ceilings in the Kitchen, Dining & Great Rooms. Patio doors to the 10x10 deck overlooking a level, fenced yard. Updated light & plumbing fixtures. Downstairs find a woodburning fireplace in the spacious Family Room with sliding doors that exit to the 10x10 covered patio. All bedrooms have ceiling fans & overhead lights. Oversized 19x22 2car garage. So many updated details inside & out! Don't miss this move in ready home! Seller offering HSA warranty & will leave the refrigerator. This one is SHARP & ready for you! Honey, stop the car & call the movers! Hwy 70 to north on Hwy M (North Main Street) through north O'Fallon. Right on Pieper Rd. Right on Strawberry Hill Estate Dr. Right on Goldenrod. House on right. OR Hwy 79 north to L on Old Hwy 79. L Pieper Rd, L Strawberry Hill Est. Dr, L Goldenrod.